My grandmother, Madonna Rose Toulouse, attended St. Joseph’s Residential School for Girls in Spanish, Ontario. She contracted pneumonia during her time there, nearly died and was sent home to Wikwemikong First Nation on Manitoulin Island. For the rest of her life she had chronic lung issues because of this illness. Madonna has been in the Spirit World for almost five years now. It is important to know that my grandmother was one of the strongest and funniest people I have ever known. She was a storyteller; known for her humour, conveying of genealogy and sometimes harsh (but true) advice. Madonna continues to have a profound and deep impact on me and this is why Truth and Reconciliation in our schools hits close to home. I am so glad that this complex part of our Canadian story is going to be remembered, retold and hopefully learned from. So what is at the core of Truth and Reconciliation in K to 12? What does it actually look like in the day-to-day classroom activities of our children, youth and young adults? This article offers a glimpse of the possibilities for relationship building, curriculum connections and personal growth. Residential school impacts, Indigenous peoples’ contributions, understanding treaties and cultural teachings are themes that provide a foundation for all students.1 Each of these topics first and foremost has to be centred around the Indigenous communities where your school is located. For the educator, it means taking that step to reach out and connect with the First Nations, Métis and/or Inuit peoples in the area. This may begin with contacting the person responsible for Indigenous education at your school board. Or it may start with attending Indigenous events in your area (e.g. Walking With Our Sisters installation, Red Dress campaign, Louis Riel Day, Arctic Winter Games, powwows). Either way, this process will require your time and the ability to keep an open mind. Having the ability to say “I don’t know” and learning together is what educators and students do in classrooms that honour Indigenous ways of knowing.2 Many educators in K to 12 fear getting Indigenous content wrong or misrepresenting the information. This is why it is important to include a variety of resources that are authentic, and why I am a strong advocate for Indigenous voices speaking for themselves and integrating them across the curriculum. I suggest having traditional and contemporary knowledge keepers about residential schools, treaties and the teachings be valued guests in K to 12. 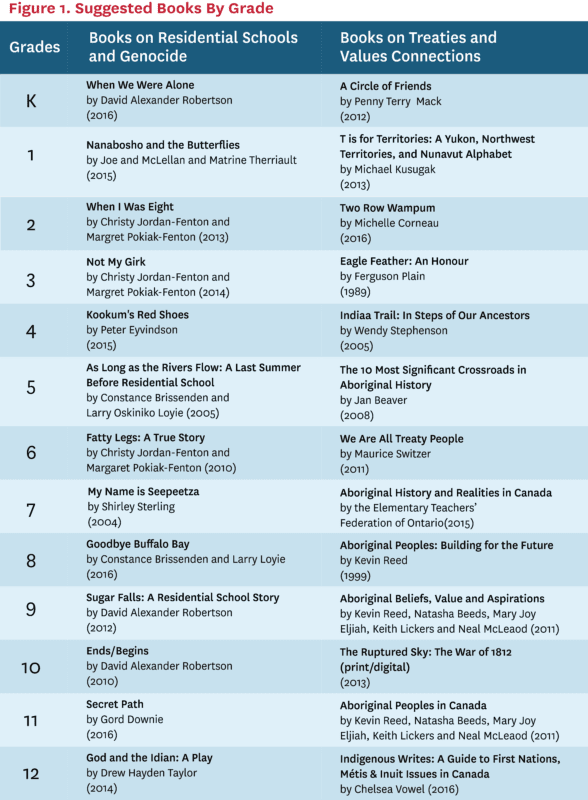 These meaningful visits need to be supported by lessons (pre and/or post) that are interactive, hands-on and have real-life applications.3 The content of these lessons can come from these suggested books on residential schools and treaties for elementary and secondary classrooms (see Figure 1). Please note that this is not meant to be an exhaustive list, as each province and territory may have its own suggested resources on these topics. I am very lucky to work with some amazing people at my university who have innovative ways of approaching reconciliation with action at the centre of it. Shelly Moore-Frappier is the Director of our Indigenous Sharing Learning Centre (ISLC). She comes from the elementary/secondary system and taught for a number of years at that level. Shelly and her team at the ISLC have designed and continue to deliver a program called “One Dish, One Spoon.” This program bridges elementary students (Indigenous and non-Indigenous) to the university with Truth and Reconciliation as the main driver. Grade 6 students from our region come to the university to hear from Indigenous youth who are making a difference in social change. Thirteen-year-old Autumn Peltier, known for her advocacy for water, is one of the key speakers, as well as other Indigenous role models. The Grade 6 students spend the day immersed in workshops and activities centred on their interests and ways to implement reconciliation in our schools and communities. Each school leaves with a commitment to a project that they will engage to implement Truth and Reconciliation (such as a community garden commemorating survivors and inviting residential school survivors to guest speak at their schools). Project of Heart and their lived philosophy of students leading change is truly reconciliation in action. This national initiative honours the voices of survivors and provides a space for youth (and their mentors) to communicate their learning journeys. One can’t help but feel inspired by the multitude of stories where our young people share what they have learned (and are doing) about the residential schools legacy. Another project that touches my spirit is the 2016 Science Camp at Algoma University, where 40 Indigenous students from local First Nations participate in a week of focused activities. These 12- to 15-year-olds toured Shingwauk Residential School, listened to the stories of survivors and created wooden tiles (installation pieces) with personal reflections. When you take a closer look at the tiles, the message “forever loved, never forgotten” stands out. These words underpin the work of our youth and their brave mentors across this country. I have had the honour of knowing Troy Maracle (Hastings Prince Edward District School Board), Jody Alexander (Ottawa-Carleton District School Board), Kathy Dokis-Ranney (Rainbow District School Board) and many other Indigenous Leads for years. I’ve seen their collective work in action and their tireless advocacy for Indigenous inclusion across K to 12. These individuals and their network of supports have implemented reconciliation activities like Orange Shirt Day, Shannen’s Dream, KAIROS Blanket Exercises, Treaties Week and National Indigenous Peoples’ Day on June 21 (for URLs and more activities, see box: “Reconciliation Activities for Schools and Allies”). These folks, their students and their communities’ commitment to Truth and Reconciliation are making the difference. Their leadership and community connection is the promise of reconciliation in action. I am Anishinabe. My mother was Odawa and my father is Ojibwe. I also consider myself an ally for human and other-than-human rights (the earth and her children). Being an ally is a role that we all must occupy if we wish to see a better future for our children and the next seven generations. Allies from all walks of life are critical to implementing the Calls to Action from the 2015 Truth and Reconciliation Commission of Canada (TRC) Report.4 Defining oneself as an ally requires understanding who you are, why you are involved and how you can make a difference. For myself, I see advancing the TRC calls as directly connected to my role as a teacher and a learner. I have spent a good part of 25 years focused on Indigenous education, with a specific emphasis on pedagogy. This has led me to some interesting and ever-evolving observations, the most prominent being that what works for Indigenous students often works for most others. 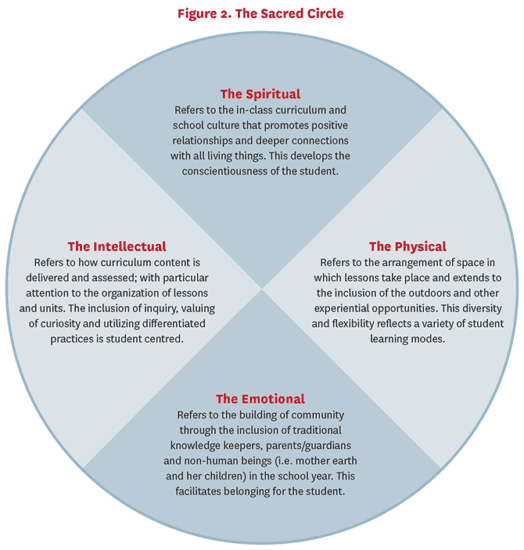 Classrooms that build from a holistic model and/or consideration for the whole child tend to work for all students5 (see Figure 2). This means that allies need to commit to reconceptualizing their classrooms and how they teach all students. It further requires planning our school year with the spiritual, physical, emotional and intellectual aspects of education in mind. This model and teachings come from the Anishinabek of my area. Each Indigenous Nation has their own understanding of holistic education. The physical refers to the classroom space/s where learning takes place and encourages differentiated practices outdoors and in the community. This aspect of holism encourages teaching/learning at sites that make connections to local events, people, places and movements. The emotional concerns the inclusion of Elders, Métis Senators, Cultural Resource People, families and non-human experiences as foundational to the classroom and school year. This aspect of holism values the knowledge that “other teachers” bring to the shared world of education. The intellectual refers to the provincial/territorial mandated curriculum that the educator is entrusted with delivering to the students. This aspect of holism calls upon the educator to factor in inquiry, curiosity and differentiated evaluation as critical to meaningful student experiences in school. The sacred circle is a place where we all belong and have a role to play in this journey towards Truth and Reconciliation. Being and becoming an ally for each other (human and non-human) is the only way to bring those Calls to Action forward in K to 12. Professional in-service, curriculum inclusion, policy development and engaging with each other is only part of the solution. Developing real relationships, acknowledging our failures and finding new ways to support the TRC in our classrooms will be the real challenge.6 I’ve accepted this call. I am reminded of it every time I drive past a school, stop behind a school bus, or talk to one of my students. I hope that you too accept this call as we move forward, together, in a space of respect, truth and transformative change. 1 Margaret Kovach, “Treaties, Truths and Transgressive Pedagogies: Re-imagining Indigenous presence in the classroom,” Socialist Studies/Études Socialistes 9, no. 1 (2013). 2 C. Savage, R.i Hindle, L. H. Meyer, et al., “Culturally Responsive Pedagogies in the Classroom: Indigenous student experiences across the curriculum,” Asia-Pacific Journal of Teacher Education 39, no. 3 (2011): 183-198. 3 G. Ladson-Billings, G., 2014. “Culturally Relevant Pedagogy 2.0: Aka the remix,” Harvard Educational Review 84, no. 1 (2014: 74-84. 4 Karina Czyzewski, “The Truth and Reconciliation Commission of Canada: Insights into the goal of transformative education,” International Indigenous Policy Journal 2, no. 3 (2011). 5 Jan Hare, and Michelle Pidgeon, “The Way of the Warrior: Indigenous youth navigating the challenges of schooling,” Canadian Journal of Education 34, no. 2 (2011): 93. 6 Rosemary Nagy, “The Truth and Reconciliation Commission of Canada: Genesis and design,” Canadian Journal of Law & Society/La Revue Canadienne Droit et Société 29, no. 2 (2014): 199-217.